The controversial conservative activist James O'Keefe spoke on the topic of free speech without interruption in Middlebury Thursday night. About 40 people gathered in a small event room at the Courtyard Marriott to hear O'Keefe, whose Project Veritas has been in the national news this week for a botched sting that targeted the Washington Post. He declined to answer questions about why Veritas apparently attempted to plant a fake story in the Post, saying the group does not discuss its "motives or methods." But O'Keefe vowed to keep doing undercover work and video exposés. "I don't consider anything off limits," he told the audience. At least 15 people in attendance were members of the media, and at times they seemed to take up most of the space in the room. A few Middlebury College students and residents of the town turned out too. "I care about free speech. I think that hearing from O'Keefe is important," said Samuel Zimmer, a Middlebury College sophomore, after the talk. O'Keefe's talk came as the college deals with continued fallout from a visit by The Bell Curve author Charles Murray in March. Protesters shut down his talk and mobbed Murray as he attempted to leave campus. The incident triggered national discussion about campus free speech. O'Keefe's speech was billed as a response to "Middlebury's Free Speech Problem." Zimmer said that's a fair statement. "I certainly think that there is [a problem]," he said. 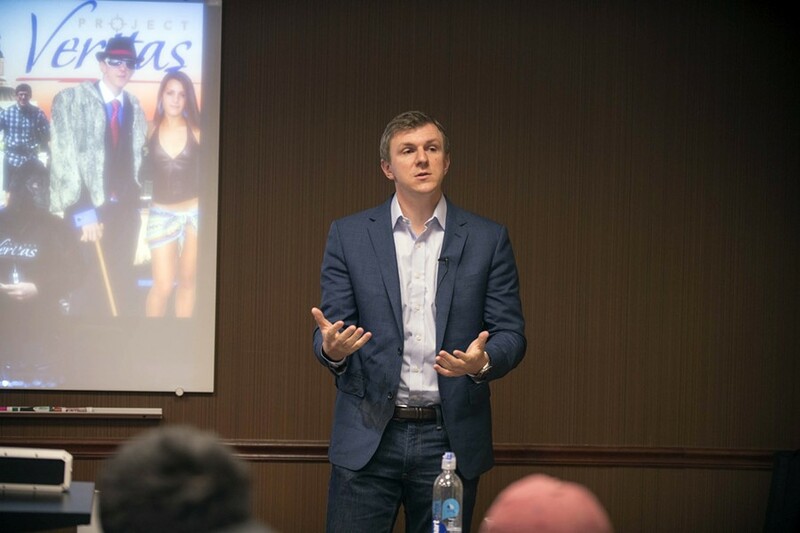 While O'Keefe was reluctant to talk about the Washington Post sting, he walked the audience through several other Veritas Projects that targeted Acorn, National Public Radio, Planned Parenthood, CNN and voter fraud in New Hampshire. O'Keefe said the mainstream media has too many sacred cows and it's up to organizations like Veritas to go after stories the rest of the pack ignores. "There is so much crap, and so much fraud and so much hypocrisy," O'Keefe said. He added: "I will never be out of work." He took digs at the Washington Post, the New York Times, CNN and even Fox News. As for criticism that Veritas videos are selectively edited, all journalism is selectively edited, O'Keefe claimed. Still, while he insisted that his methods are in some ways consistent with mainstream journalism, he also portrayed himself as a crusader against a "leviathan" mainstream media. "Nobody, and I mean nobody, is willing to do what I do," O'Keefe said. Zimmer introduced O'Keefe but said he is not a member of the Preservation Society, the group that was billed as the sponsor of the talk. While promotional emails said the Preservation Society is a Middlebury College student organization, college officials said it is not a registered group. Asked who was funding his talk, O'Keefe told the audience that the Leadership Institute had kicked in a few thousand dollars. The Virginia-based organization describes itself as a conservative training institute. Leadership Institute field representative/contractor Emily Faulkner was at Thursday's speech but declined to provide details about her work. Gregor Clark of Middlebury was disappointed when O'Keefe declined to answer a question he posed about the motivation for the Post sting. O'Keefe's response was evasive, Clark said. Despite what O'Keefe says, he does have an agenda, said Clark, a travel writer. Still Clark was glad the talk went forward without being shut down by protests. It was "appalling" that Murray was shouted down last spring, Clark said. 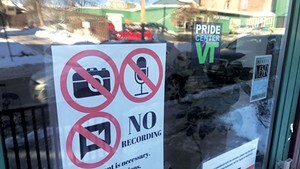 The incident painted Middlebury as "this intolerant place," Clark said. Public dialogue is important, Clark added. There were no visible protests, although security was fairly tight. Middlebury police walked through the conference room with a canine before the speech began. A hotel manager stood at the door monitoring the people coming and going. O'Keefe said during his talk that the security was unusual and came in response to threats this week. He said he put his early work on his credit card, but that now Project Veritas has a budget of $4.5 million to $5 million annually from donors who appreciate his work. "Nothing's going to stop us, ever," O'Keefe said.